Timeless Textures -- Happy Birthday Sunshine! Hello! Welcome to the Stamp Review Crew Bonus Blog Hop. Thanks so much for stopping by! 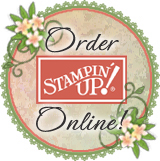 The Stamp Review Crew is an international group of Stampin' Up! Demonstrators who gather for a blog hop the first and third Mondays of the month to review a single stamp set. This week's hop is a BONUS HOP and instead of looking at one stamp set, we are looking at the Host stamp sets that are available in the Annual Catalog and Holiday Catalog. I've chosen the Pun Intended Host stamp set from the Annual Catalog (top row, middle of the graphic above). By the time you've traveled through the hop, you are sure to find a number of great ideas using these fun stamp sets. So sit back, relax, and get ready to start pinning ideas to your Pinterest board! I have three projects to share with you where each card showcases one of the focal point images from the Pun Intended Host stamp set. I kept the card designs simple and stuck with a single color palette for all three cards: Daffodil Delight with Basic Black and/or Whisper White. I'll be sharing the how-to's for these projects in the next week or two, so I hope you'll return to see the the inside sentiment areas for each of these projects and the coordinating decorated envelopes. Be sure to visit all the stops on this week's hop to find more ideas for using the Host stamp sets from the Annual Catalog and Holiday Catalog. Just click on the NEXT or PREVIOUS buttons below to continue. We're on the same page this week, Mickey, with the black/white/yellow combo! I love your cards and I'm planning to give that lightbulb card a try with its big beam of light. They're all super cute!! Fun cards! I really enjoy the middle light card - great sponging!! These three make a wonderful set! Love the bold colors and crisp layouts.